Non-Manipulative Selling, from Wexler, Barrea and Alessandra, is a great overall book that includes some theory and a lot of tactical selling advice. It offers an overall emphasis on understanding behavioral styles. 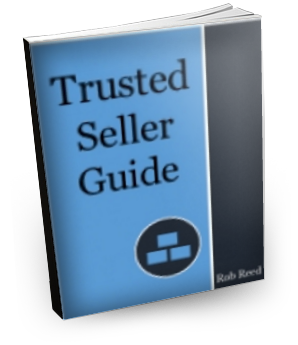 The goal of the book is help the reader learn to sell with flexibility by adjusting to each prospect’s style. The six-step selling process described by the authors is particularly useful. With its details on behavior styles, Non-Manipulative Selling will be beneficial for those involved in complex and transactional sales. This book is very congruent with an ethical selling philosophy and principles. 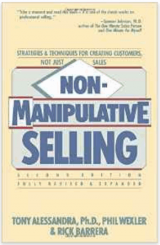 Non-Manipulative Selling is a practical book, oriented toward the process of selling. The authors offer instruction on practice with every idea they present. The emphasis on practicality is not surprising when you consider that the book originated in 1975 as a seminar workbook. The authors note in the Preface that since the original publication, many others have written, spoken, and taught about non-manipulative selling. They feel, however, that most of those are trotting out a non-manipulative philosophy as a surface over the traditional sales hard sell approach. The book begins with five chapters that explore the skills a salesperson brings to his or her craft. With chapter titles like “Relationship Strategies” and “The Power of Listening, Observing, and Feedback,” these chapters address the techniques required for non-manipulative selling. The authors then present six chapters on the sales process itself. These chapters cover subjects ranging from meeting the prospect to assuring customer satisfaction. First we’ll take a look at the authors’ view of non-manipulative selling compared to traditional selling. Then we’ll review examples from three chapters of the book. The authors argue that traditional objection-handling, sales pitches, and closing techniques are not consistent with non-manipulative selling. As a result, it is often difficult for organizations and individuals from traditional sales cultures to adopt non-manipulative techniques. Not enough training. This causes salespeople to learn from role models. Unfortunately, role models normally rely on traditional sales techniques. Too much product training. This results in a seller who can only talk about products. He or she ignores — or is unaware of — the other issues that surround the product, such as how it relates to buyer needs and concerns. Since different buyers work in different cultures, have different goals, and respond to different issues, a seller who only understands product features and benefits is not well-prepared to address issues that really concern buyers. Inappropriate sales training. Sales training often focuses on how to present, close, and overcome objections. These traditional techniques certainly work, in the sense that they deliver sales, but they don’t work well to deliver long-term customers and healthy, respectful relationships. They often produce an environment where the salesperson “wins” and the customer loses. Non-manipulative selling puts the emphasis on planning, meeting, and studying, the early steps in the sales process. This approach leads to a greater understanding of the customer’s needs. Rob Reed is a former management consultant with one of the top consulting firms in the country. He was a top sales producer with the highest-rated sales force in health care selling high-end capital medical equipment and information technology to hospitals. Rob has researched over 20,000 pages of material related to online and offline trust development. He has authored numerous white papers, book reviews and articles on sales and marketing and has been interviewed and quoted in Sales & Marketing Management and Selling Power magazines.